This medication may cause withdrawal reactions, especially if it has been used regularly for a long time or in high doses. In such cases, withdrawal symptoms (such as restlessness, watery eyes, widened pupils, sweating, runny nose) may occur if you suddenly stop using this medication. To prevent withdrawal reactions, your doctor may reduce your dose gradually. Consult your doctor or pharmacist for more details, and report any withdrawal reactions right away. What conditions does Belladonna Alkaloids-Opium 16.2 Mg-60 Mg Rectal Suppository treat? To prevent constipation, maintain a diet adequate in fiber, drink plenty of water, and exercise. Consult your pharmacist for help in selecting a laxative (such as a stimulant type with stool softener). Tell your doctor right away if any of these unlikely but serious side effects occur: mental/mood changes (such as agitation, hallucinations, confusion), difficulty urinating, fainting, slow/fast heartbeat, eye pain, vision changes, signs of your adrenal glands not working well (such as loss of appetite, unusual tiredness, weight loss). Get medical help right away if you have any very serious side effects, including: severe stomach/abdominal pain, seizures, slow/shallow breathing, severe drowsiness/difficulty waking up. List Belladonna Alkaloids-Opium 16.2 Mg-60 Mg Rectal Suppository side effects by likelihood and severity. This medication should not be used if you have certain medical conditions. Before using this medicine, consult your doctor or pharmacist if you have: a certain muscle/nerve disease (myasthenia gravis), certain stomach/bowel diseases (paralytic ileus, blockage, infectious diarrhea), glaucoma (narrow-angle). Before using this medication, tell your doctor or pharmacist your medical history, especially of: kidney disease, liver disease, lung diseases (such as asthma, chronic obstructive pulmonary disease-COPD), breathing problems (such as slow/shallow breathing, sleep apnea), a certain spinal problem (kyphoscoliosis), difficulty urinating (for example, due to enlarged prostate or narrowed urethra), personal or family history of a substance use disorder (such as overuse of or addiction to drugs/alcohol), heart problems (such as irregular heartbeat, heart failure, coronary artery disease), high blood pressure, brain disorders/injuries (such as seizures, head injury, tumor, increased intracranial pressure), thyroid disease, gallbladder disease, disease of the pancreas (such as pancreatitis), adrenal gland problems (such as Addison's disease), mental/mood disorders (such as toxic psychosis), stomach/intestinal disorders (such as colitis, ulcer), glaucoma (open-angle), heartburn. What should I know regarding pregnancy, nursing and administering Belladonna Alkaloids-Opium 16.2 Mg-60 Mg Rectal Suppository to children or the elderly? This drug should not be used with the following medication because very serious interactions may occur: naltrexone. If you are currently using the medication listed above, tell your doctor or pharmacist before starting belladonna/opium suppositories. Before using this medication, tell your doctor or pharmacist of all prescription and nonprescription/herbal products you may use, especially of: cimetidine, certain pain medications (mixed opioid agonist-antagonists such as pentazocine, nalbuphine, butorphanol), potassium tablets/capsules, pramlintide, rifampin. Should I avoid certain foods while taking Belladonna Alkaloids-Opium 16.2 Mg-60 Mg Rectal Suppository? If you are using this medication regularly and miss a dose, use it as soon as you remember. If it is near the time of the next dose, skip the missed dose and resume your usual dosing schedule. Do not double the dose to catch up. Are you taking Belladonna Alkaloids-Opium 16.2 Mg-60 Mg Rectal Suppository? 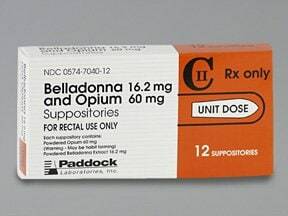 Are you considering switching to Belladonna Alkaloids-Opium 16.2 Mg-60 Mg Rectal Suppository? How long have you been taking Belladonna Alkaloids-Opium 16.2 Mg-60 Mg Rectal Suppository?